December 2, 2018 By Eugene Nielsen & filed under All Articles, Skills, Survival. 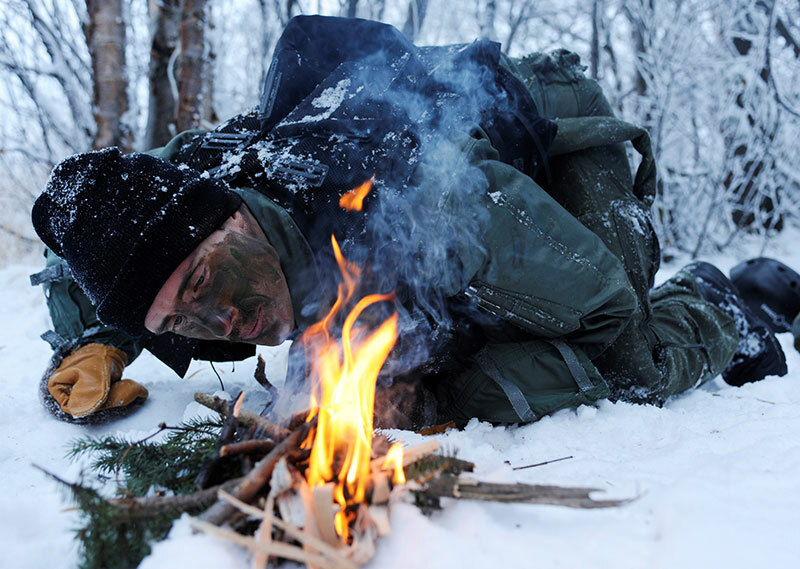 The ability to start a fire is a key factor in surviving in the wild. It can mean the difference between life and death. The conditions won’t be ideal. You need redundant ignition methods to ensure at least one works in any environment. A good lighter cannot be matched for its all-around utility and convenience. It will always be the quickest and simplest method of starting a fire. Most of the time it’s all you need. A Zippo® lighter along with a couple of disposable butane lighters take up little space in your pack or bug-out bag. The Zippo lighter is considered by many to be the best long-term survival lighter in the world. It features a simple, bulletproof design. All parts are replaceable and it comes with a lifetime warranty. It can use almost any liquid fuel that will ignite when exposed to a flame. If you don’t have fuel or a wick, you can still use the striker to ignite light dry tinder. Zippos do have their cons. The fuel evaporates quickly with the standard housing. It’s not weather-resistant. And it has a candle-like flame, making it difficult to ignite things on the ground and in windy conditions. Butane lighters are less prone to evaporation and are available in direct flame (torch-like) models. But they don’t perform well in colder temperatures. The boiling point of butane is approximately 32.9° F at sea level. Additionally, direct-flame butane lighters don’t work at elevations greater than about 8,000 feet above sea level. 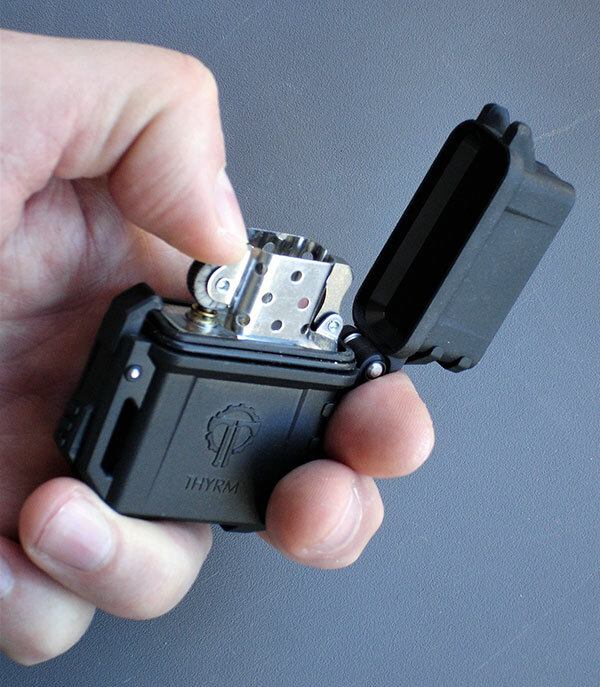 Disposable butane lighters have a candle-like flame similar to the Zippo and perform better at higher elevations than their direct-flame counterparts, although cold temperatures are still an issue. Disposable butane lighters are inexpensive but more prone to breakage and failure, which is why it’s always wise to carry more than one. Thyrm PyroVault is designed to “up-armor” the classic Zippo lighter for outdoor and survival applications. It’s made of rugged polymer and is PALS/MOLLE compatible. Thyrm® LLC has come out with a new product called the PyroVault™ that’s designed to improve the classic Zippo for outdoor and survival applications. The PyroVault is a heavy-duty housing that accepts standard Zippo-style lighter inserts, including both fluid and butane direct-flame models. The PyroVault is made of rugged, heat-resistant polymer and is O-ring sealed to keep the elements out and minimize evaporation. It has a spring-loaded cap for one-handed operation and an integral low-profile PALS/MOLLE clip to attach it to your gear. It is self-standing, allowing for hands-free use with a fluid insert. Thyrm PyroVault accepts standard Zippo-style lighter inserts, including both fluid and butane direct-flame models. It is O-ring sealed for weather resistance and to minimize evaporation. Thyrm also offers a classic Zippo fluid lighter with the Thyrm logo. It may be purchased at a discount with the PyroVault or separately at additional cost. 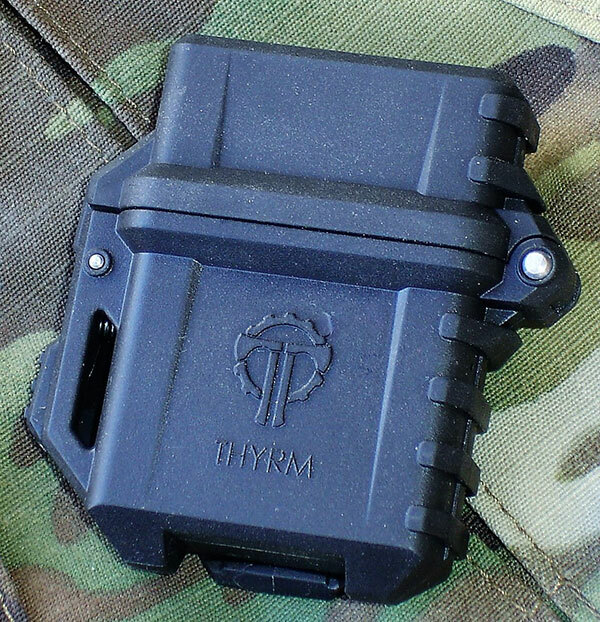 Thyrm is hoping the fluid (classic Zippo insert) appeals to those who may need to “field refuel” since, as mentioned, they work with lots of different flammable liquids possibly found in a survival situation. Thyrm doesn’t plan to offer butane inserts for the PyroVault, as the butane inserts are imported. The company also feels butane inserts are geared more toward urban use or where sustainability isn’t an issue. Butane inserts, such as the Z-Plus Extreme, can be found on Amazon® for around $18. The PyroVault is exceptionally well-designed and well-made. I consider it a must-have for anyone who carries a Zippo. 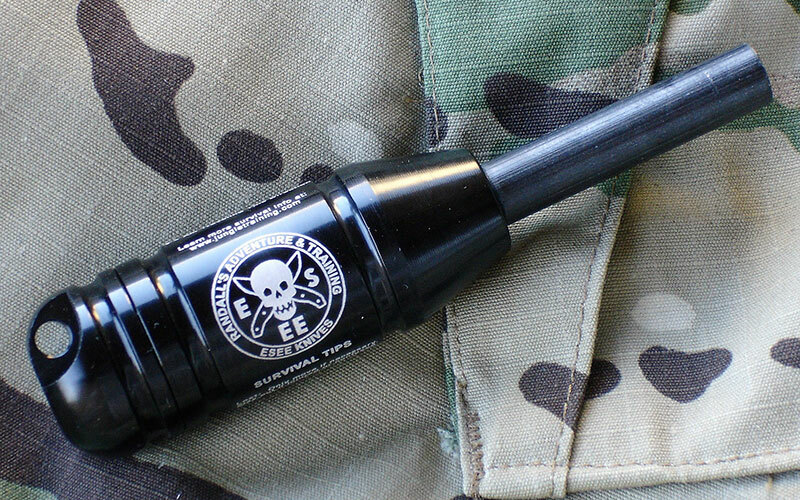 ESEE Fire Kit is a “last-ditch” fire starter (ferro rod) and mini survival kit container that includes a 20mm button compass in the cap and survival tips printed on the body. Watertight capsule has plenty of storage space for survival essentials. A ferrocerium (ferro) rod is indispensable as a back-up fire-starting option. Ferrocerium is a pyrophoric alloy that usually includes iron, cerium, and magnesium. When struck, a ferro rod produces hot sparks that can reach temperatures of 5,430° F.
Ferro rods and other methods that create sparks provide a reliable method of ignition that works in conditions where lighters and matches would fail but require more preparation and can be difficult to use in less-than-ideal environments. I went with the ESEE® Fire Kit from ESEE Knives/Randall’s Adventure & Training. All ESEE products are the result of extensive real-world experience. The Fire Kit is not only a last-ditch fire starter but a mini survival kit container as well. The Fire Kit has a removable/replaceable 1.75-inch ferro rod. The handle is made of heavy-duty black-anodized aircraft-grade aluminum alloy and provides a good grip. The handle also serves as a waterproof container, with plenty of storage space inside for tinder or other user-supplied survival gear. 20mm Grade A button compass in cap of ESEE Fire Kit has luminous dial with large, easy-to-read markings. Survival tips and ground-to-air signals are silkscreened on the handle. 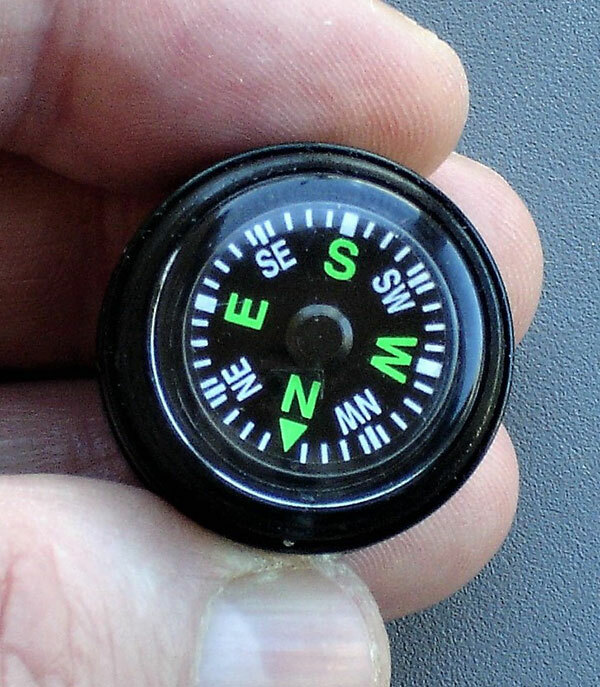 The cap is O-ring sealed and has a 20mm Grade A button compass with large, luminous markings. It also has a lanyard hole that allows you to attach a wrist lanyard or tie or clip the Fire Kit to a belt, pack, or vest. The Fire Kit is lightweight and takes up very little space. It measures only 4.5 inches in overall length by 0.5-inch wide and weighs only four ounces. As with all ESEE products, the Fire Kit is exceptionally well made. It comes with a wallet-sized plastic card with fire-building instructions. I keep SOL® Tinder-Quik™ in my Fire Kit so I always have tinder at hand. Tinder-Quik is waterproof, easy to light, and burns for one to two minutes, giving plenty of time to start a fire. The Thyrm PyroVault and ESEE Fire Kit are outstanding products, and they’re made in the good ole USA, as are Zippo lighters. The PyroVault is available in Black, Flat Dark Earth, Olive Drab, Rescue Orange, and Urban Grey. It has an MSRP of $29.99. Thyrm offers a Thyrm logo Zippo for $14.99 with PyroVault or $19.99 without. The ESEE Fire Kit has an MSRP of $57.95. A 12-pack of SOL Tinder-Quik runs about $4.00.